Saturday was a splendidly sunny spring day. 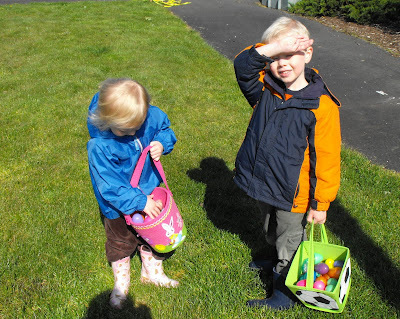 I began the day carting off the kiddos to a local Easter Egg Hunt, then brought them back home to hang with the husband unit. Next, I darted off for a quick trip to Fred Meyer to find Easter basket fillings. Really, it's all I meant to get. But, I parked near the garden entrance (out of habit of course) and found that the shopping cart steered itself right to that garden center where I completely lost all sense of time. Frankly, it was blissful. The glorious sunshine had inspired many to think about their flower gardens as well. With the cart full and my arms juggling the extra stakes and such that could not fit in the mini 2 tiered cart (seriously that's all that was available) I found myself dodging the rest of town participating in last minute Easter shopping. A reminder text came from the husband unit as I needed to be back in time for Rowdy Roo's T-ball game. Clearly, the man realizes that he likely had lost his wife to the garden center. At any rate. I was late to the game. 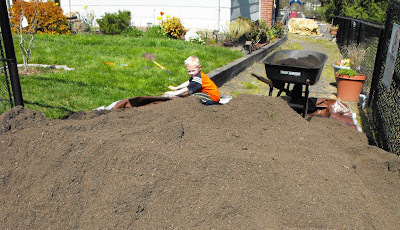 While I was 'Easter basket shopping' our delivery of garden soil arrived from Swanson's. I choose the 'Garden Soil Blend' as the pH levels seemed good for most vegetables. I spent the rest of the afternoon shoveling the beautiful dirt. The new garden boxes were filled in by early evening. 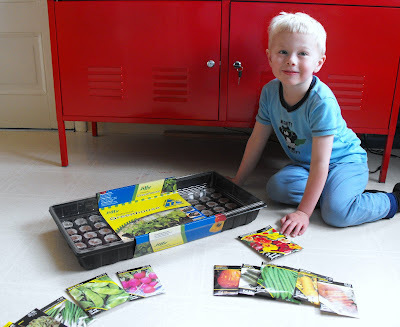 Today, the kiddos and I began sowing seeds indoors in hopes of having ready plants for when the daytime temps consistently stay in the 60's F. One can hope that day will come. The forecast for the next two weeks looks to be in the low 50's F for daytime highs w/plenty of rain. Boo. I am pleased I got so much accomplished during our one day of sun. Today, in between blustery rain showers, I also sowed some cool weather veggies directly in the garden boxes. It's a start at least. LOL Jenni. Sounds like a great day of 'Easter shopping'. Your beds look fantastic. They will all be for vegetables? I'm sure that has a lot of advantages, using the raised beds. I am not a good vegetable gardener, but I'll throw a few tomatoes plants in with the perennials and see what happens! Great pictures. Glad you had a lovely Easter. I am in love with your raised beds! You certainly have my sympathy. We have had one day in the 60's. It looks like your son was really enjoying the mound of dirt! I'm glad you had a good day. Hopefully there will be more in the near future. What a lovely, fun Easter day you had. I love your raised beds. I went to Fred Meyer last week and ooh, la, la was I inspired. I ended up with two pink flowering Bacopa for a hanging basket, dark pink marguette sp? daisy and a bare root rose called 'Sea Foam.' I went to the store for a can of spray paint, ha ha. Love your raised beds, dear. You're a good mom to do this with your kids--lifelong memories! Funny that I do my shopping more at Fred Meyer's this time of year, my cart always steers to garden area too. Saturday was so nice and looks like you made the most of it. It's at least nice to know that it can make it to 60, now hopefully we'll get more of those types of temps. I have to admit my Saturday was incredible lazy, after my Hubby cut the grass in the morning we headed off Downtown to visit the Chinese Garden and then we found lots of cafes and restuarants who were serving on their patios and we just chilled out, it was the first time in 2 weeks I had been out of the house (silly chest infection) so I made the most of it. It was wonderful to see and feel the sun and everyone was so HAPPY! What adorable children! Your raised beds are beautiful. Oh, why didn't I think of putting tarp under mine?!? (wailing now) I can't believe you got all that dirt in those beds in one day! Muscles! Oooh, impressive raised beds! They look really professional. Will look forward to seeing them filling with produce. I laughed at your shopping trolley deviation. And a double-decker one at that! I'm trying to avoid garden centres just now because it's too early to plant things out and I'm also working on cleaning up our patio.